The X From Outer Space. Conte on paper, w/ mat 18 x 24 inches. $120. 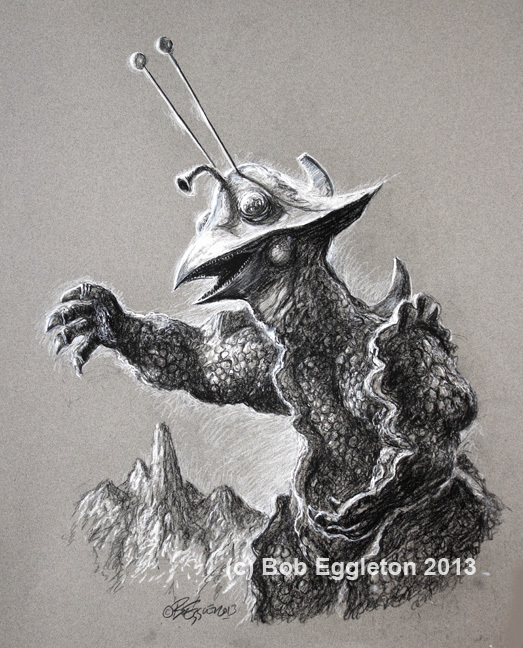 In 1967, Shochiku Company of Japan entered the Kaiju genre with what may be the goofiest monster ever: Guilala. It was a one shot film that had a weird charm for the time, garish colors and fun FX work. In 2006 a sequel/send up of the film was made in Japan. Anyway, this is a drawing I did of the titular spore-based creature known affectionately as the giant chicken monster from space.